Juicy Stakes Poker is extending another Grade A tournament weekend with a new Monday Freeroll on the menu with to two extra $500 freerolls, a guaranteed bounty tournament and a guaranteed turbo R&A already added to the Saturday/Sunday schedule. Sunday’s $15,000 Guaranteed will, as usual, be the biggest event this weekend. 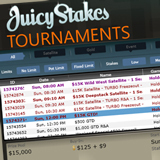 The action heats up over the weekend, but Juicy Stakes has a 24/7 schedule of multi-table tournaments, Sit & Go's, satellites and direct qualifiers to the poker world's most prestigious live events. Buy-ins range from only a few cents to a few hundred and there are always ‘no pay’ tournaments in the form of freerolls, Gold Chip and Gold Card events. Frequent players can now take advantage of drastically reduced withdrawal fees and collect points even when they take a poker break to play Blackjack or slots.